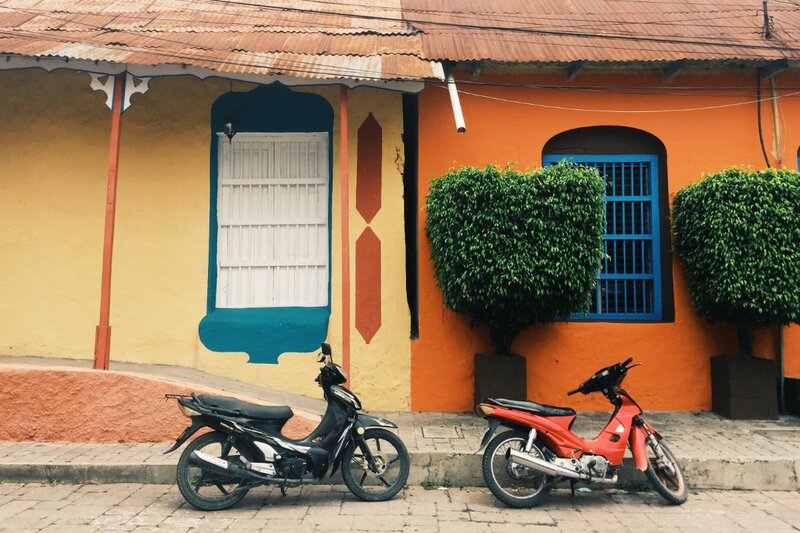 Believe it or not, every street in Flores, Guatemala is just as colorful. Photo by Rachel Kurlander. Traveling on a budget is all about compromise, but in Central America it doesn't have to be: You can find beachfront properties and superior amenities like pools, saunas, rooftop bars, and on-site restaurants for a steal — if you know where to look. Save on these four accommodations, all with starting rates under $17/night, so you can spend a little more on the experiences that will make your trip an unforgettable one. If an affordable (dare we say, cheap?) remote island paradise sounds like the stuff of myths, then Caye Caulker, a small island in the Caribbean Sea off the coast of mainland Belize, will make a believer out of even the most spend-thrifty travelers. You won't find any paved roads or (functional) ATMs, but the rum and reggaeton flow freely. Life on Caye Caulker moves slowly, so don’t be surprised if you get admonished by locals for walking too fast. SAVE at Yuma’s House Belize. Enter through a sandy courtyard filled with palm trees and hammocks, lounge chairs, picnic tables, and swings befitting a tropical beachfront hangout, and behold the charming, bright-colored hostel. It's bare bones to be sure (don’t expect hot showers or AC), but you won’t be spending much time indoors anyway. Snooze the day away in a hammock or, if you can muster the strength, walk the 20 feet down to the water’s edge and dive in. Rates start at $16/night. SPLURGE on a scuba diving excursion. Expert divers flock to this tiny island for the Belize Barrier Reef, the second largest coral reef system in the world, but tour companies on Caye Caulker cater to all levels. 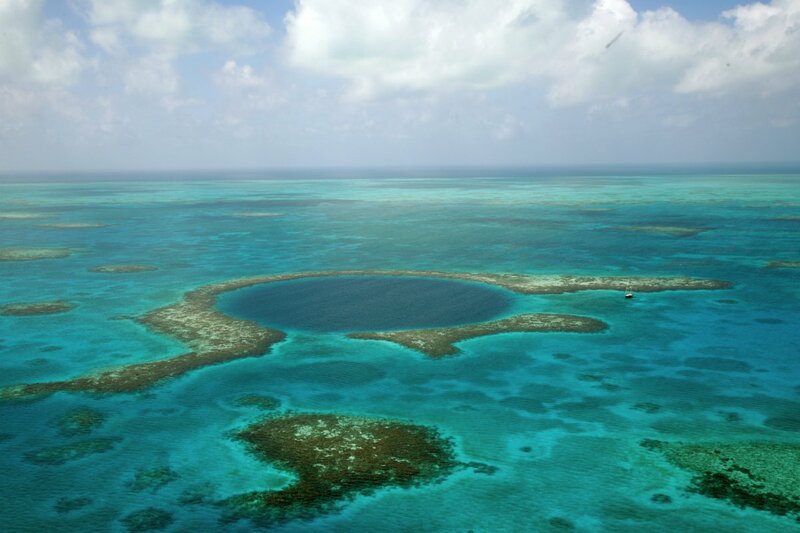 The great blue hole, Belize’s most famous dive site, is an underwater sinkhole lined with stalactites and limestone, deep blue in color and almost perfectly circular. While the depth and low visibility make for a challenging dive, the shallow, crystal clear waters of the Hol Chan Marine Reserve are perfect for beginners (and even snorkelers) undaunted by the possibility of swimming alongside nurse sharks, stingrays, and eels. The great blue hole in Belize's Great Barrier Reef as seen from above. Photo by the TerraMar Project. This small island on Lake Petén may just be a stopover on your itinerary — it’s the closest “major” town to the Maya ruins of Tikal — but visitors will tell you that Flores is a destination in its own right. It only takes about 20 minutes to walk the circumference of the island, but give yourself a day to wander aimlessly down cobblestone alleys and gawk at one colorful stucco façade after another. SAVE at Los Amigos Hostel. 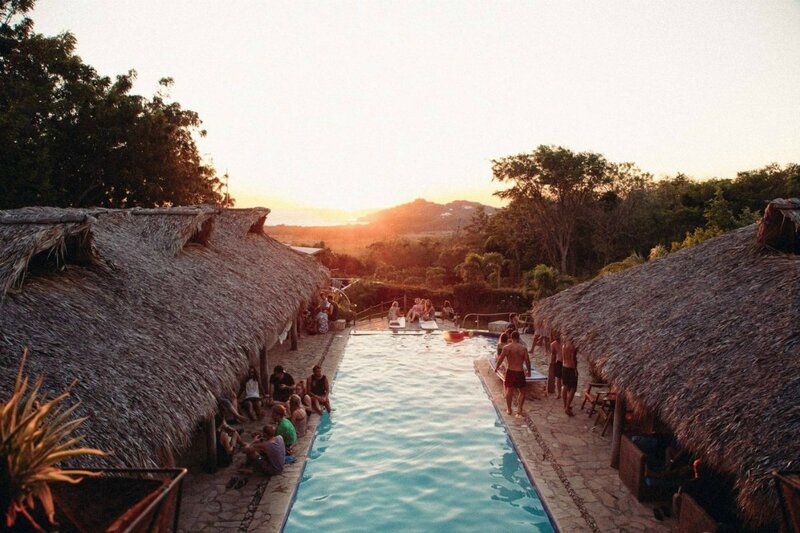 Spend some time in Central America, and you’ll likely hear travelers raving about Los Amigos: It’s one of those rare hostels that everyone seems to know about, regardless of whether or not they’ve been. The most impressive feature is the garden in the middle of the property, a dense sanctuary of tropical plants, fountains, nooks with hammocks and swings, and a common area where you’ll find guests lounging on couches at all hours of the day, sipping on giant smoothies from the hostel bar and seeking out the turtles, iguanas, and birds that roam the courtyard. There’s also a spa, night lounge, and travel desk with multilingual staff on site, so it’s easy to see why word of Los Amigos travels fast. Rates start at $11/night. 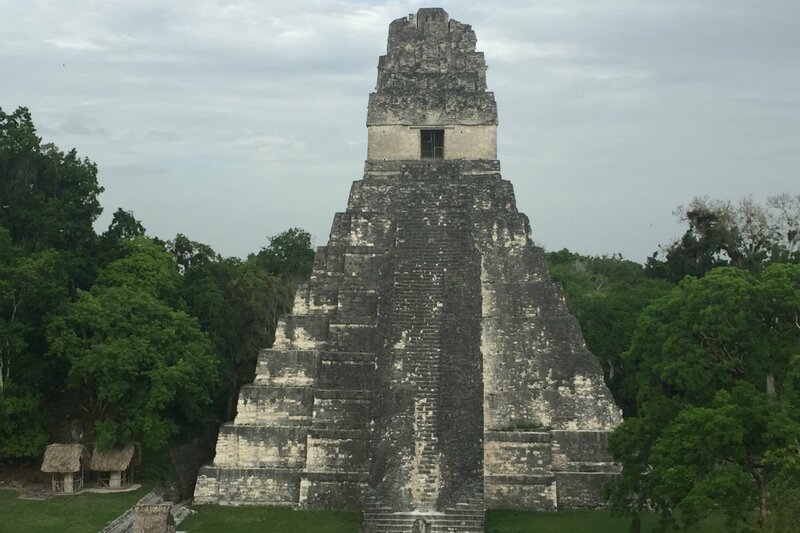 SPLURGE on a guided tour of Tikal. If you’re in Flores, chances are it’s because you intend on visiting Tikal, a UNESCO world heritage site and one of the preeminent Maya ruins in Central America. While anyone is free to explore the park on their own, the experience is incomplete without an understanding of the world within which this city was built. Since there are no placards or expository materials inside the park, anyone who isn’t an archeologist or anthropologist specializing in Early and Late Classic Mesoamerica could probably learn a thing or two from a licensed guide. The verdant courtyard at Los Amigos hostel. Temple I, the largest Maya temple at Tikal National Park. Photo by Rachel Kurlander. Beautiful Spanish architecture and Baroque churches in bright yellow, red, and orange hues infuse this charming former colonial capital with warmth and vitality — which can also be said of the three volcanoes (both active and inactive) that surround the city. With its emerging international food scene, great Spanish language schools, and nightlife options that befit a city twice its size, Antigua is a destination in its own right. SAVE at Tropicana Hostel. It’s a running joke at Tropicana: The biggest lie you can tell yourself is “I’m checking out tomorrow.” Whether that’s because you love the hostel or because you’ll need a day or two to nurse your hangover before actively contemplating riding a chicken bus again is anyone’s guess, but in the end, almost everyone at Tropicana winds up extending their stay. The staff, mostly young, outgoing backpackers, fosters a lively and social atmosphere, organizing drinking games and bar crawls, but if you choose to relax poolside (yes, this hostel has its own pool) with your nose in a good book, that’s fine, too. Rates start at $12/night. 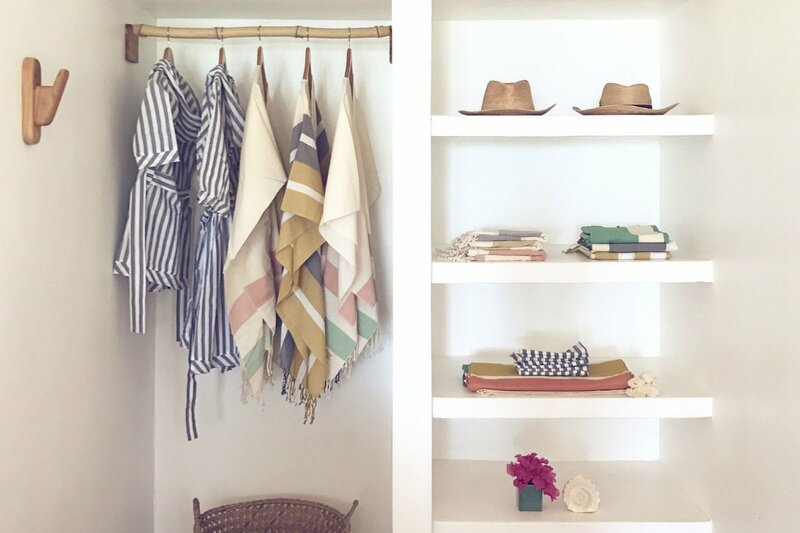 SPLURGE on a guilt-free shopping spree at one of Antigua's many boutiques that work directly with weavers, artisans, and tanners in Guatemala and are committed to ethical business practices. Head to Wayil by Algodones Mayas for gorgeous textiles handwoven from natural cotton and up-cycled denim thread; ditch your boring travel clothes for playful, bold apparel at Stella 9. Luna Zorro incorporates traditional weaving techniques into contemporary design for tasteful home decor, like pillows, towels, and throws. If you’re really feeling spendy, La Casa del Jade displays some of the most exquisite jade jewelry in the city. No room left in your suitcase? Buy a stylish, handmade, Guatemalan leather weekender from Kolt to stash all your new loot. 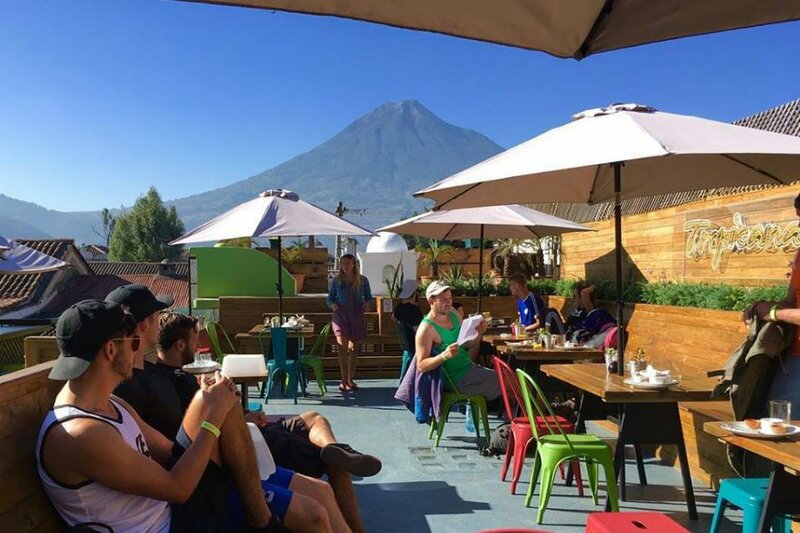 The rooftop at Tropicana Hostel, with the active Pacaya Volcano in the distance. Photo courtesy of Tropicana Hostel. Luna Zorro works with directly with weaving cooperatives and artisans from the highlands of Guatemala. Photo courtesy of Luna Zorro. 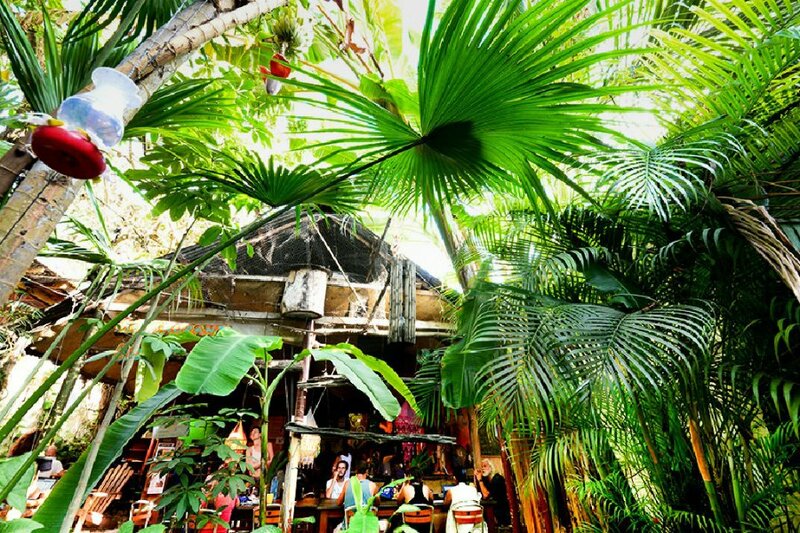 San Juan del Sur is best known for two things: beach breaks and bacchanalia. The reputation of the legendary “Sunday Funday” party has spread far and wide, drawing young travelers from all over the Americas to the small seaside surf town every Sunday for an afternoon of riotous bar crawling and pool hopping. Nearby Playa Maderas, a reliable spot for some of the best beach breaks in Nicaragua, is a surf haven for beginners and pros alike. You’ll find plenty of surf shops, boutiques, and cafes here that wouldn’t feel out of place in Southern California, but venture off the few main streets, and the town takes on a whole new feel. SAVE at Casa de Olas. Whether you’re the 8 a.m. beer bong type or feel more at home relaxing poolside, sipping on a cold Flor de Caña and coke and taking in the breathtaking sunset, Casa de Olas is every young reveler's dream. There’s a massive pool in the center of the property surrounded by thatched-roof huts and a covered common area with a bar and plenty of seating for family-style dinners. Everyone is here to socialize, making this the perfect spot for solo travelers. Drinking games are going at all hours of the day, but if you need a break, the hostel runs frequent (free) shuttles to and from the town center. Truth be told, if you’re looking for a quiet getaway, you should probably avoid Casa altogether — there are lovely family-run hostels in town that are much more low-key — or visit during the week to avoid the Sunday Funday crowd. Rates start at $16/night. 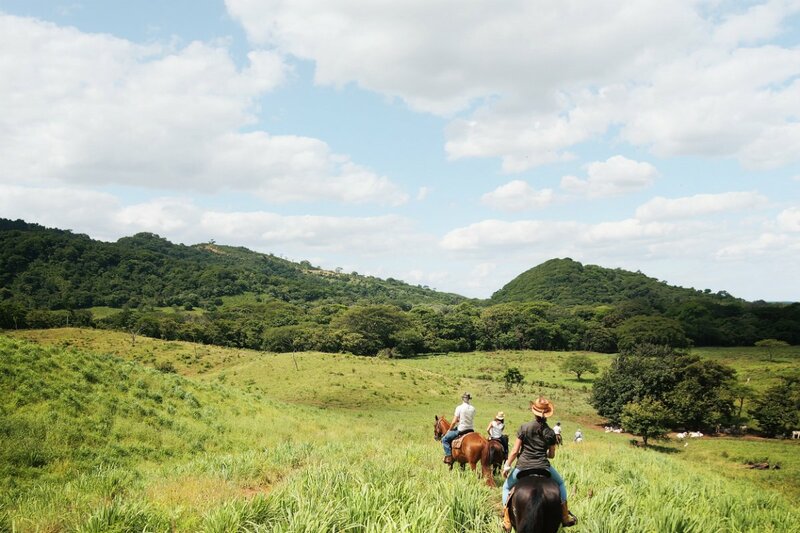 SPLURGE on horseback riding at Rancho Chilamate. If you’ve ever dreamed of dramatically galloping off into the sunset, movie credits-style, then this is the activity for you. Riders get to experience Nicaragua’s wild, natural beauty up close, as experienced guides lead tours over lush hillsides, open fields, and down to a secluded beach. The horses are well cared for, and a portion of the profits from every ride goes to the local community development fund. Rancho Chilamate offers morning, afternoon, and sunset horseback riding tours for riders of all skill levels, including children. Transportation to and from San Juan del Sur, equipment rental, and post-ride Flor de Caña are included. Perched on the hills above San Juan del Sur, Casa de Olas promises unbeatable sunset views. Photo courtesy of Casa de Olas. The best way to see Nicaragua is on horseback. Photo courtesy of Rancho Chilamate. Is Panama City the Next Riviera Maya?